Showing off my Art Deco mantle clock that I purchased on eBay in 1998 from someone in South Florida. I’ve included some photos showing the Art Deco Mantle Clock, the makers marks on the Mantle Clock, the clock face and the base mark on the clock. 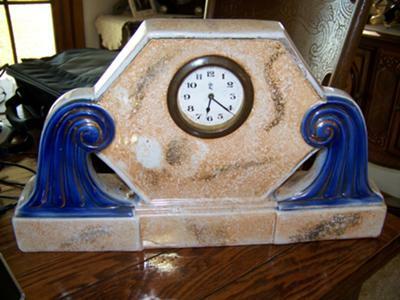 My Art Deco Mantle Clock and Candlesticks are ceramic and have been glazed with peach, blue and gold. The clock face has a small head of Diana or some other goddess on it but no words. 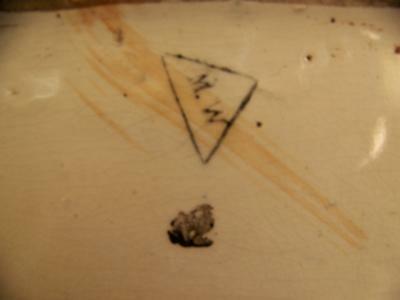 The marks on my art deco mantle clock garniture set are 546 over 1 (like a fraction) and a black triangle with M.W. in it. I chose this antique clock because the colors went with my dining room and the clock works. But, after moving they are no longer a great fit for the new house and I would love to know what I have before I attempt to resell them. 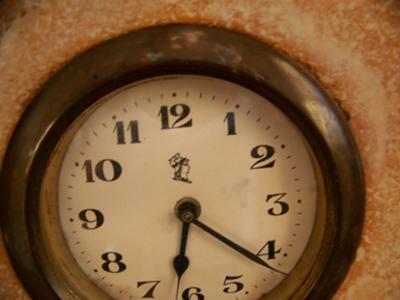 If possible, I would like to know who made the Art Deco mantle clock and possibly when and where. 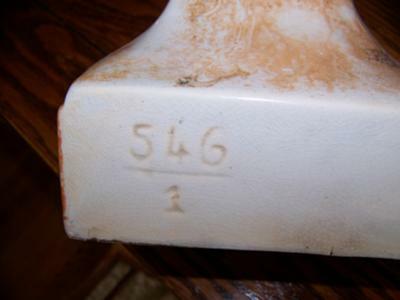 If you recognize the marks or can point me to a resource where I can look them up it would be very much appreciated. I bought an art deco mantle clock in Belgium (2011) with this same mark if this helps to clarify its origins. With help from other sellers on eBay I learned that my garniture set was produced by Majolica Wasmuel in Belgium in the early 1900’s (probably around 1920). The clock works are probably German in origin and commonly sold to ceramics makers for these types of decorative clock sets. I found another ceramic mantle clock on eBay with the same M.W. mark and the fraction mark. The seller was in the UK and indicated the clock was of French origin. I am trying to learn more about that clock from the seller and will add the info here if the seller contacts me with anything new.